In 1980 Anadromous Incorporated, a division of British Petroleum, retained the international engineering firm CH2M Hill to design and supervise the construction of a continuous flow through fish hatchery capable of utilizing, treating and passing back into Fort Creek 20,000 gallon per minute. The fish holding facility consists of eight (8) reinforced concrete raceways, each being 450′ long by 15′ wide by 4′ deep. In addition, a 2 acre detention/desiltation pond was also constructed. Facility buildings include a 38′ x 90′ incubation building complete with two 2.1 million BTU diesel fired boilers to warm water in the winter, two pump buildings, a storage building, and a large shop which houses an 800 amp, 3 phase-480 volt power room, shop, feed storage, and showers. There is also a 12x60 portable office and a large pipe shed. On November 23, 1982 the Anadromous hatchery received it’s NPDES Permit 3593-J to raise up to 150,000 pounds of fish in the hatchery at a time. Construction of the hatchery was completed in the Fall of 1984 and was in full operation in 1985. The NPDES Permit to continue operation was renewed in August, 1990. In January of 1991, Anadromous Incorporated however decided to stop operations at the hatchery due to low “return harvest” percentages at their Coos Bay, OR facility where the hatchery’s smolt were being taken to be released. In November of 1991, the earthen embankment that supported the gravity flow of water through the hatchery failed during maintenance and was not replaced leaving the hatchery high and dry since that time. 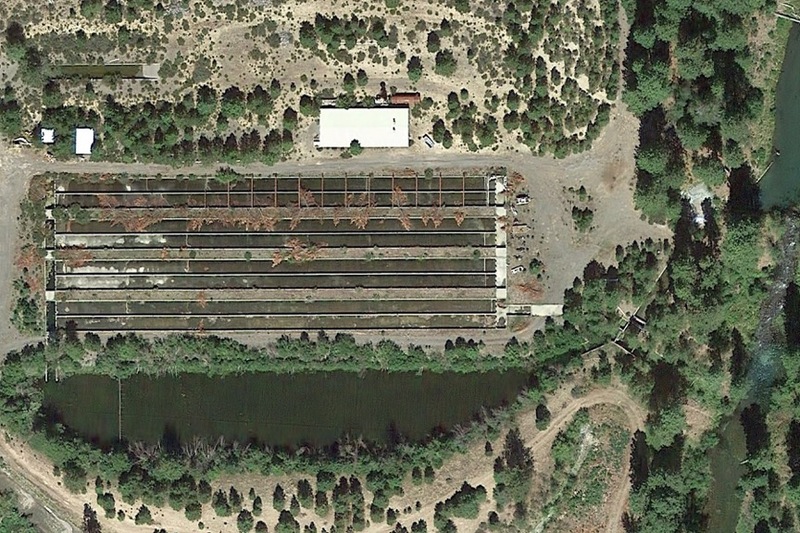 Fort Klamath Ranch Enterprizes, LLC has begun retrofitting the flow through hatchery into a “state-of-the-art” Recirculating Aquaculture System (RAS) that filters and recycles 100% of it’s water. This environmentally neutral technology was developed in Europe and is common in Canada. As such, government permitting is simplified and the water demand from sensitive surface waters is eliminated. At present, the sustainable raising of White Sturgeon and possibly other species for retail market is expected to begin in the Spring of 2018. However, opportunities may also exist for the contract rearing and reintroduction of endangered species into public waters (see Klamath Fall Herald & News December 20, 2015 article, “Salmon Hatchery Resurfaces”). With the scheduled 2020 removal of downstream dams on the Klamath River, the reintroduction of Chinook Salmon, Coho Salmon and Steelhead is a reality and fish hatcheries will be needed for some time to jump start this effort. Such an endeavor by Fort Klamath Ranch would likely be done under the stewardship of a government or tribal agency.